Hi all, it's Gwen back again for this month's edition of Gwen's Gems! Have you ever had a project you completed that you really just couldn't stand? For the most part, I know that not everything is going to turn out perfectly and that it's all a part of the learning process - I'm okay with that. (Not to get too philosophical, but does "perfect" really even exist in art?) That said, every now and then I'll make something that I dislike so much that I don't even want to look at it! This happened with a project I did a few months ago that I disliked more and more as time went on, to the point where I hid it behind my guest bed so I couldn't see it. 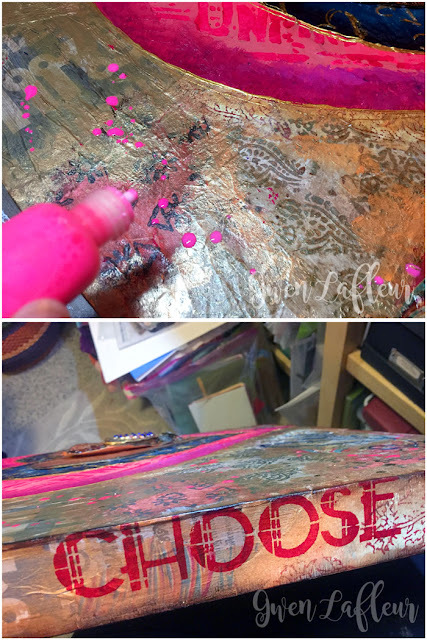 This month, I pulled it back out, gesso'd over the whole thing, and started anew. The feeling of relief as I covered it all up... I can't even tell you how happy it made me! 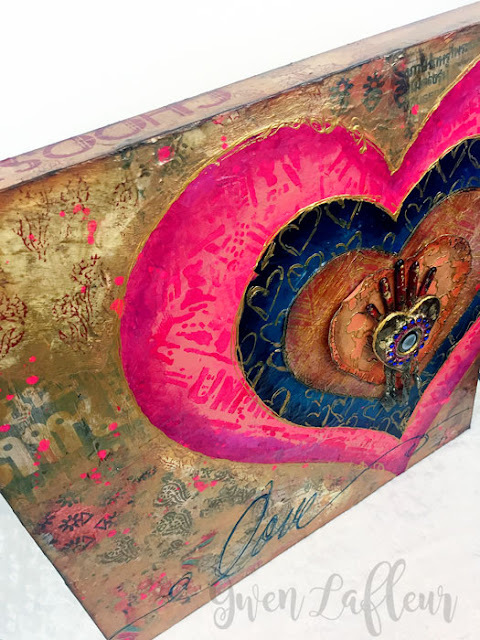 This is collage, clay, stenciling, and a few other things on an 18x18x1.5" birch cradled panel. I didn't have any particular inspiration for this piece - not consciously, at least, but it just hit me as I was looking at something totally different. 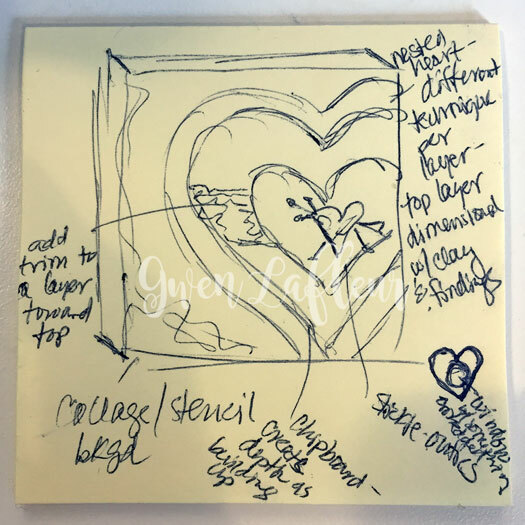 I was at work, so I grabbed a post-it note and quickly sketched out my idea, stuck it in my purse, and went back to work. Yes - I work this way a lot! 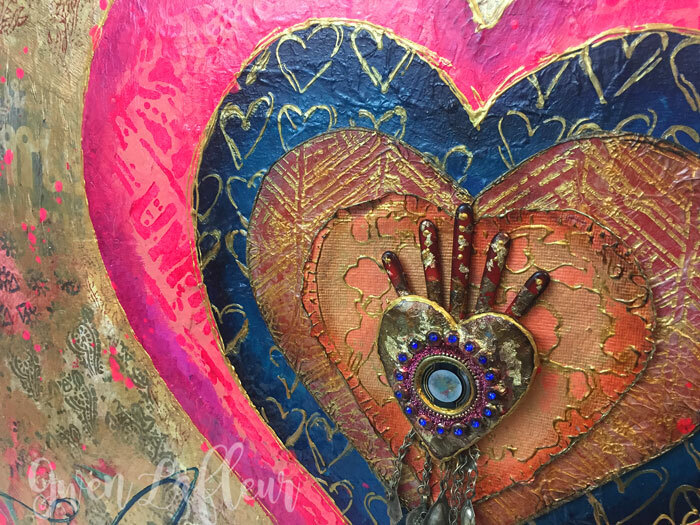 I love an intuitive process as much as the next person, but it's also important to know what works best for YOU. I almost always work better with some kind of blueprint - mental or written. 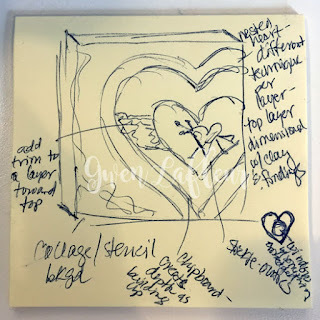 I like to start with a framework or general idea, then let intuition work out the details... as you can see here, this is not a detailed sketch! I'll write down ideas that come to me, and I'll frequently decide against them, but this helps me avoid that freezing that can happen when you sit down to work and get overwhelmed by the idea of starting something. When I got home that night, I took out that old panel, gleefully covered it all with gesso, then used molding paste to cover over a few things and add lots of texture across the whole surface. When it was dry, I started collaging all kinds of papers over the background and around the sides of the panel. 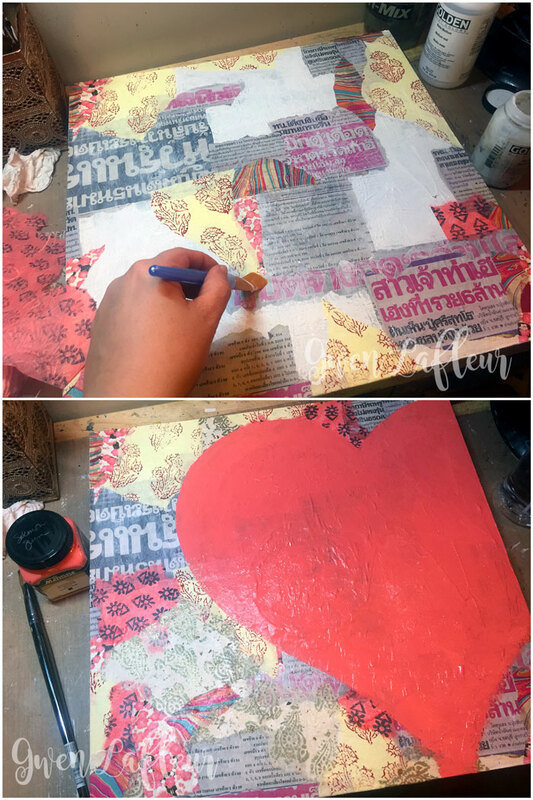 I used some block printed papers, a sheet from a Thai newspaper, printed tissue paper, and a few pieces of Japanese Chiyogami (Yuzen) paper. The pink from the pieces of Thai newspaper that I used started to inform the color palette, so I just went with it. I free-handed a large heart, painted with Salmon Matisse paint, then I let it dry. 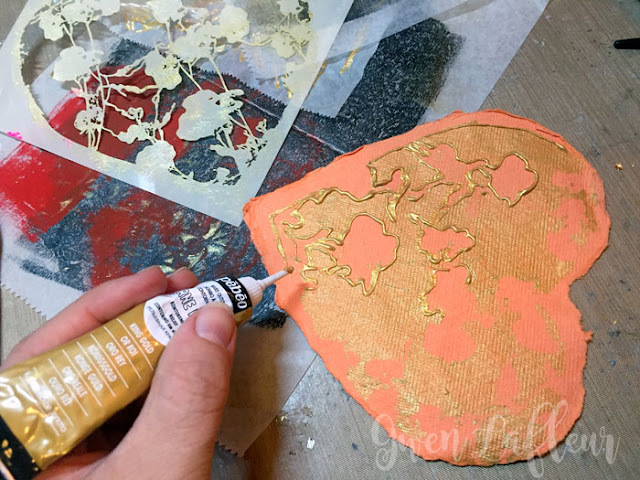 I used a bit of glaze to knock back the collaged background (you can just mix some brown paint with glazing medium - I like to add some interference gold too.) I also used a bit of gold paint to help blend over hard lines and unify it. I used the Unfinished stencil by Seth Apter with some fluorescent magenta paint to add some words and texture. Next I started prepping some of the other layers I was going to add. 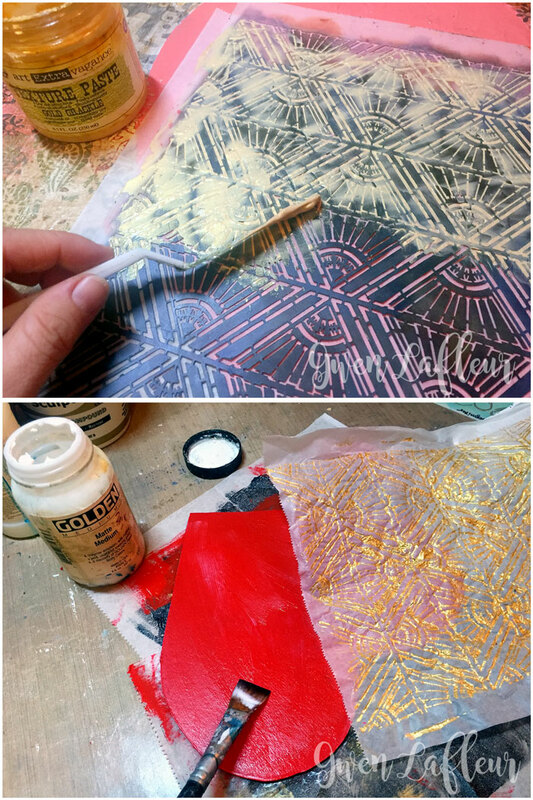 I started by putting some gold crackle paste on deli paper through my Art Deco Sunburst Background stencil and set that aside to dry. While that was drying, I went back to my panel and took the wood heart I'd been using as a template and positioned it, then loosely sketched around it, only about 1-1/2" out to indicate where I was going to paint the next heart. 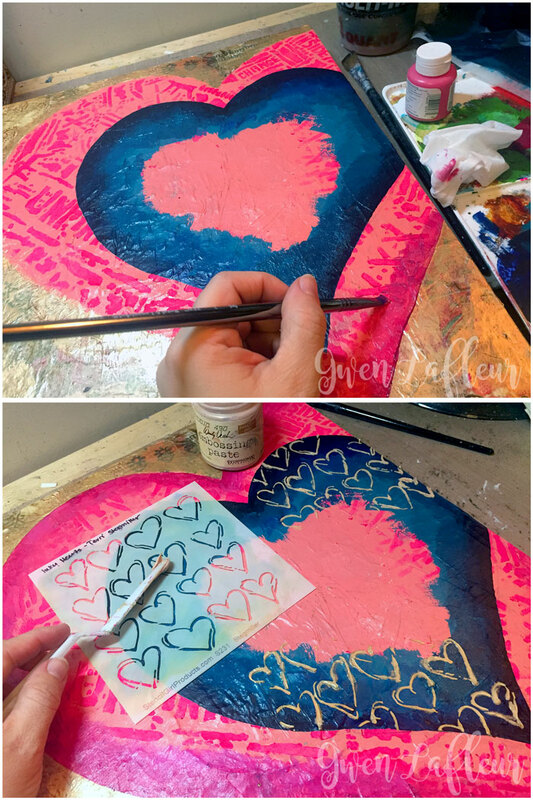 Next I took the Inky Hearts stencil by Terri Stegmiller and put some gold embossing paste hearts onto my blue painted heart and let that dry. Time to work on the second to top layer... 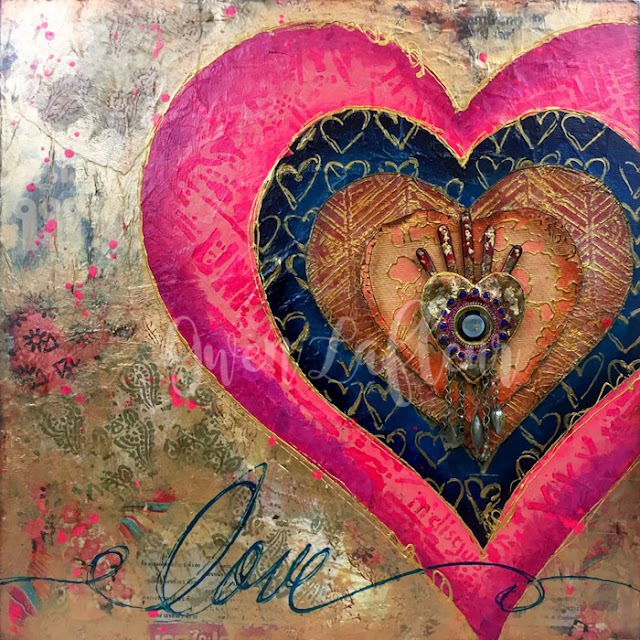 I took a fun little heart torn from pink Indian cotton rag paper and stenciled Margaret Applin's Heart and Vine stencil with gold paint, then outlined the shapes with a gold paste from Pebeo. Finally, I worked on the clay piece that was going to be the focal point. 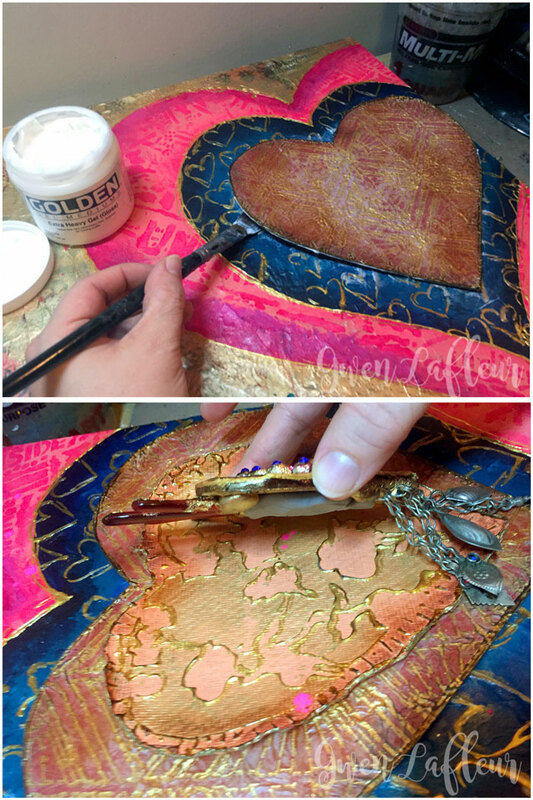 This process is pretty similar to how I make the pieces in my Mini Mixed Media Medallions class. 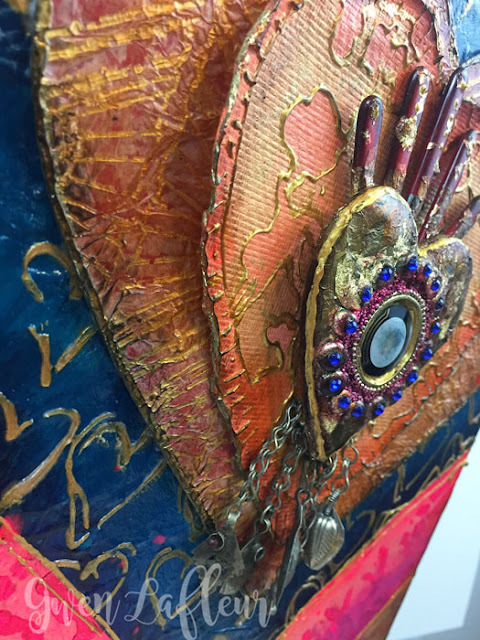 I use Aves Apoxie Clay as the basis for the sculpture, added some Turkmen jewelry parts to dangle from the bottom, then used some gold foil to cover the main piece. I added some long red beads (I call them stickie-outies) to the top - adhered with more clay... I thought it echoed the shape of a flaming heart. I added a bit of gold foil to those as well. 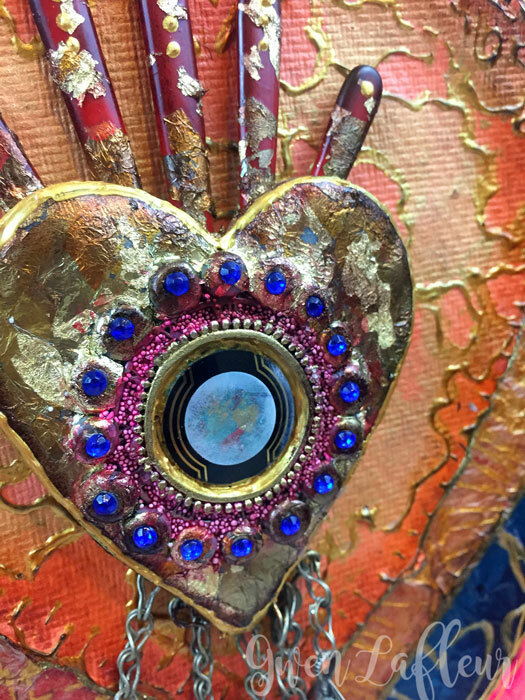 I let that whole piece cure and then added some vintage rhinestones, gold paint to cover un-gilded clay, and a glass watch-face with a frosted over effect that hid a tiny gold heart inside. Time for finishing touches! 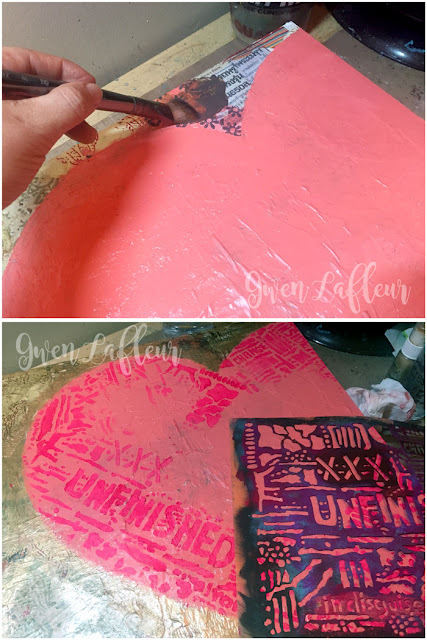 I wanted to get more pink to unify the piece, so I added some splatters made from fluorescent pink fluid acrylic paint and airbrush medium. 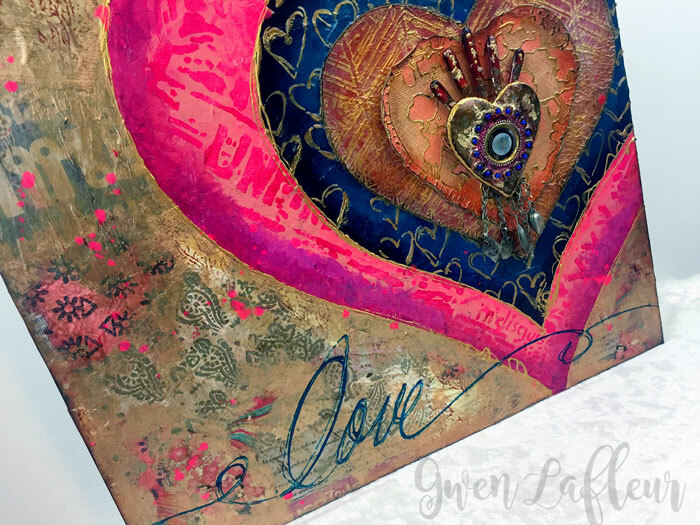 Finally, I used a blue fine-line paste from Pebeo to write "love" across the bottom front of the panel. 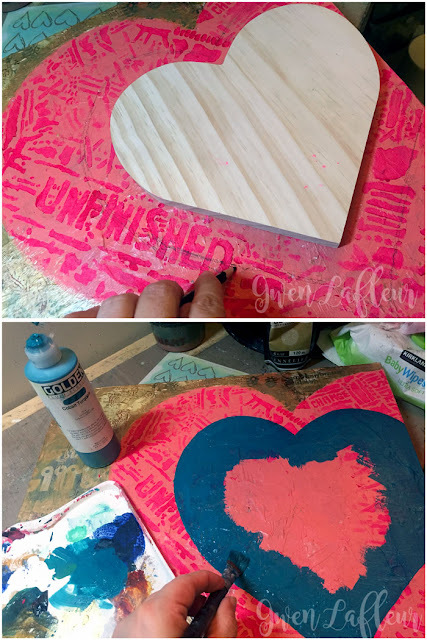 I knew that I wanted the title to be Choose Love, but I didn't like how the word "choose" would look on the front, so I stenciled it onto all four sides using my Art Deco Alphabet stencil, then I glazed over it to knock back the color a bit. Voila! A finished mixed media panel that I'm absolutely loving! That's it for today... I hope you enjoyed today's project and tutorial as much as I enjoyed making it! Stunning Gwen. Those "Sticky Outies" remind me of a hand holding a heart. 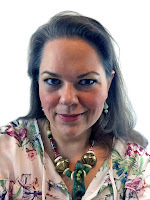 I loved reading about your creative process. Thanks Jill! I hadn't seen the hand, but when I went back and looked I can totally see it! Totally unintentional, but cool! Gorgeous!!! I adore your creations! Thanks so much Monica - I really appreciate it! Thank you so much Amy - much appreciated! Beyond gorgeous. All those layers! Thanks Seth! It was a lot of fun to build it all up - it doesn't all show in the photos, but there's a ton of texture too! LOVE the finished project, simply gorgeous! Thanks Sandee! I'm really happy with this one... maybe I need to expand my color palette more often! Thank you Sara! Much appreciated! From despair to triumph ...way to go!